Austin is known for many things, but it has a worldwide reputation for great bars, outstanding music, and fantastic food. With this many options for food and drink, a burger bar needs to be mighty good to stay in business. Hopdoddy Burger Bar, founded in 2010 by Larry Perdido, isn't your normal burger joint. They focus on gourmet, all natural, unique burgers-and Austin loves them. With a very long line most of the time, it's regarded by many as the best burger in the city. It's not exactly surprising that Hopdoddy's is such a hit; after all, Perdido has a long history as a restaurateur. "My longtime business partner, Chuck Smith, and I opened our first venture, Saba Blue Cafe, in the warehouse district. Then, in 2003 we opened Moonshine Grill. Hopdoddy's was our third place and Old Thousand is my fourth." It takes a strong foundation of talent, knowledge, and experience to create such a varied portfolio of restaurants, but it's Perdido's storytelling talent that catapults them into success. "Most good restaurant groups have a pocket full of concepts. It's whether they have the staffing, the real estate, and the timing correct in order to launch something. For us, we know we have the personnel, the skill sets, and the recruiting awareness to grab some really talented chefs that can cook the right kind of food. The formula that we use looks at the niches, the competitive sets, and what's missing so we can tell the best story we can in that space. We have to be good storytellers. 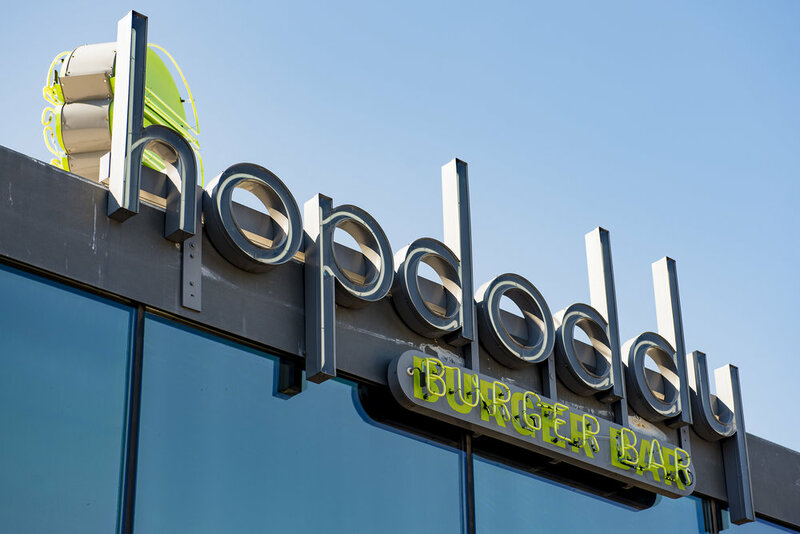 Hopdoddy's Burger Bar, named for the almighty hop, which we all know to flavor beer and doddy, an old nickname given to an Aberdeen-Angus breed of cow in Scotland, was a story that Perdido knew needed to be told. "With Hopdoddy's we wanted to offer a better burger and bring a more chefs angle to things. A lot of chefs at the time were embracing this whole movement of farm to table. I thought, let's just do it with hamburgers. We source everything correctly, create all the recipes, grind the meat, and bake in house. We eliminate all the nasty preservatives in food." No matter how compelling a restaurant's story, they need good people in order to survive. "I think it's the people part of the business that drives me, whether it's the team at Moonshine, at Hopdoddy's, or at Old Thousand, we all have different personalities, but we all bring good insights and good intentions to the business. Being a part of that creative process with some really good talent, it's reinvigorating." Perdido doesn't get good people by accident. It all comes down to recruiting. "I think it starts with the brand tenets and having a clear understanding of who we are as a company, what we believe in. We recruit to that. There's no secret sauce to it, but we're really in the people business. What's challenging at this point is the sheer number of restaurants, bars and hotels in Austin. You know how difficult it is to find really good people nowadays? I think the restaurant industry here in town is saturated with too many restaurants and not enough people. Where do we get new people? We have to recruit either nationally or regionally. Ultimately, we live and die by the people that we integrate as our restaurant family members. It's a relationship. You've got to put time and effort into the relationship and building their skillsets and honing their skillsets to make it good for the company. There is a villain in Perdido's tale- a standard, storybook antagonist that he must fight. "Unfortunately there's an ugly side to this business that a lot of people don't understand. That's the legal side of things. You're not really a veteran in the business unless you've been in some sort of litigation. It happens. There's some warning signs and lessons to learn about getting the right kind of partner, vetting them correctly, making sure that there's true alignment of business ethics and work ethics, and then having the right legal team to document it correctly." The one universal truth about a good story is that it stays with you. And for Larry Perdido, in his role as a restaurateur, that means using his influence on aspiring chefs to make sure that his legacy is everlasting. "I think there's a higher purpose, and that's helping younger, aspiring chefs to own their own restaurants. I've been talking to a lot of young guys and trying to get them to understand what the process looks like. There are challenges, heartaches, sacrifices, and rewards that come with it. I try to get them to see that other side. We call it removing the blinders. They walk around so focusedon sourcing and preparing the best food. They all want to be a Michelin star chef and so on. I tell them that's great but let me teach you how to be a restaurateur. Let me teach you how to be a great operator. Then you can go chase your dreams. Always be fiscally responsible and know what the traps and the pitfalls of the business may be." Experience more stories of your own by visiting Hopdoddy, Moonshine, and Old Thousand.